Taro root or colocasia is known as "seppankilangu" in Tamil. Usually most South Indians make either seppankilangu roast or curry or add it to buttermilk kulambu (mor kulambu) or aviyal, but this is a very different recipe with seppankilangu. I happened to taste this in one of the guest house we stayed and loved it a lot. I got the recipe from the cook there and tried it at home. 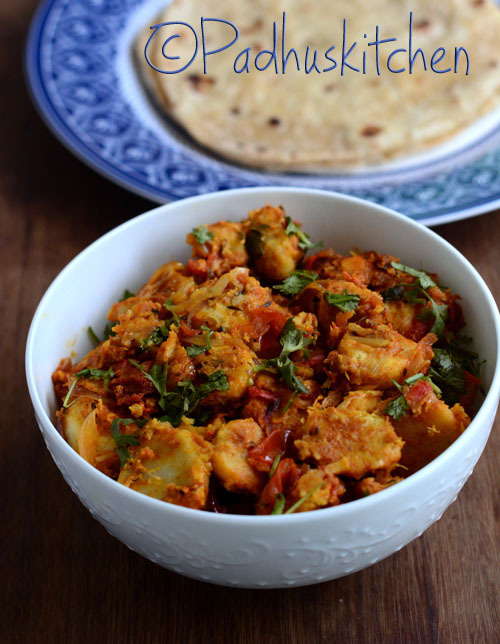 This arbi sabji goes well with both rice and roti. Today we will learn how to make Tomato Colocasia following this easy recipe with step wise pictures. Pressure cook taro root with enough water for 1 whistle. Cooking time varies depending on the quality of taro root. Some may get cooked in 1 whistle. Some may take a little longer. If you find the arbi not cooked properly after 1 whistle, cook without the whistle after that. The taro root or arbi has to be cooked until fork tender. It should not be mushy. Once cook drain the water, put them in cold water for sometime. Leave it to cool. Then peel the skin and cut it into roundels. Heat 2 tbsp of oil and add the cooked taro root. Holding the handle of the pan, toss the taro root to mix it. Avoid using spatula to mix it. Roast until lightly browned. Keep it aside. Heat oil in a pan, add cumin seeds,when it sizzles, add thinly sliced onions and curry leaves. Saute until onions turn light brown. Add ginger-garlic paste and saute for a few more minutes. Add chopped tomatoes, turmeric powder, chilli powder, coriander powder, cumin powder, kitchen king masala powder, dry mango powder and salt needed. Cook until tomatoes becomes mushy and oil separates. If it is too dry, you may add 1-2 tbsp of water. Once the tomatoes are cooked well, add the taro root and mix well. Cook for 2-3 minutes on low heat and switch off the heat. Garnish with finely chopped coriander leaves. 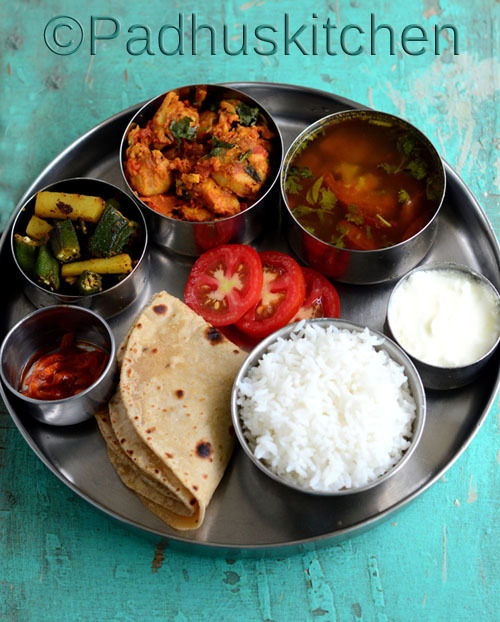 My Lunch Menu - Tamatar wali arbi - Paruppu Rasam - Aloo bhindi sabji - phulkas - pickle - rice - curd and sliced raw tomatoes. I have never cooked taro root this way. Will definitely try. I'm sure it will taste yum like all your recipes! Thanks Padma! Seems to be very nice. Should try. Very interesting. Thank you for sharing these recipes. I have been following your blog for sometime and you inspire me to cook. This seems to be a different. I will try.